The Countdown to Christmas is heating up—13 days until Christmas. I love holiday baking—I love homemade gifts, my friend’s annual Christmas cookie swap and, well, eating delicious treats. What I don’t love is high grocery bills throughout the month of December. Sugar, flour, eggs, butter, vanilla are all used in mass quantities this month, but we also need specialty ingredients & candy for our fun holiday favorites. That’s why my holiday favorites use only a few ingredients—or overlap to share ingredients with other recipes. No matter what you use for the coating, they’re super cute & pretty tasty. 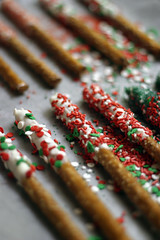 (As I recall—if anyone has a lead on gluten free pretzel rods, I would really appreciate it!) Repeat the process with plastic or bamboo spoons, and you’ve got an awesome addition to a coffee mug or hot cocoa gift. We have also made these with Rolos and a pecan, for a turtle-like treat. They aren’t as cute as the buttons, or a real chocolate turtle, but they are a lot easier to make! Use up the rest of your Hugs & Kisses with a few hot cocoa kits. Measure a single serving of hot cocoa mix (or, let’s be honest, empty a packet of mix) into a cellophane baggie. 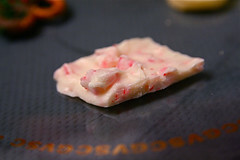 Add 2-3 Hershey’s Hugs, a miniature candy cane and a chocolate-dipped spoon. Tie with a colorful ribbon! This is super cute on its own, but you can also add it to a coffee mug, if you need a larger gift. All of these edible treats are perfect hostess gifts, or make a sweet addition to a teacher gift. They’re super easy and use similar ingredients, which makes it easy to put together a variety of treats. I like to make a few different things for the office staff, as well. What are you making this year? Awesome. We have made pretzel buttons in the past – such a hit! Great idea with the Hershey’s Hug. Will have to try that this year for Christmas. Thanks for these!